“Math and science have always been my favorite subjects,” says Kaitlyn Goncalves, a junior at New Bedford High School. “Taking Advanced Placement (AP®) Biology my sophomore year helped me decide that I wanted to be in the medical field.” Kaitlyn took AP Biology her sophomore year—it was her first AP class and her experience helped her find her passion to pursue science in college and in her career. Kaitlyn has dreams of one day being a pharmacist. After taking AP Biology, she says she feels prepared for college-level classes and is taking three more AP classes her junior year, including AP Chemistry and AP Calculus. For too many female students, especially those from low-income or minority families, encouragement and support to study and pursue careers in science, technology, engineering, or math is not common. While women make up half of the total U.S. college-educated workforce, they only represent 29% of the science and engineering workforce. But female students like Kaitlyn are well-prepared to change that trend because of increased access to and support in AP STEM classes that prepare them for the challenge of college classes. New Bedford High School joined MIE’s AP STEM and English program in 2014, and since then, enrollment in AP classes has nearly doubled, growing from 213 students in 2013 to 411 students in 2016. MIE focuses on increasing AP enrollment with a particular focus on low-income and minority students, and female students in AP math and science classes. More than 75% of students attending New Bedford are low income, 22.5% are English Language Learners, and 31.8% are former English Language Learners. As the school continues to grow its AP enrollment, MIE supports staff and teachers in increasing the performance of students, better preparing them for success in college. Kaitlyn’s AP Biology teacher, Anne Oliveira, attended MIE’s Advanced Placement Summer Institute, where AP teachers from all around Massachusetts and the U.S. come together for one or two weeks of professional development aimed at helping them sharpen their skills to lead diverse AP classrooms. Kaitlyn says that her passionate, well-trained teacher and a school environment that encouraged more students to take rigorous AP classes made all the difference for her. 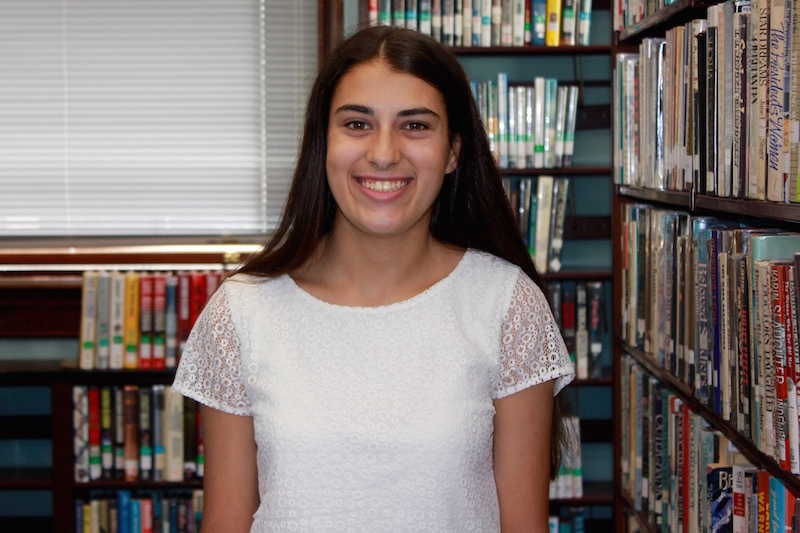 She learned to balance the demands of intensive reading and lab work in her AP Biology class and has already started looking at colleges in Massachusetts that offer degrees in pre-med or pharmacy. “I feel really well prepared for college already,” she says. Students who take at least one AP class in high school are more likely to graduate from college within four years. In Massachusetts, the overall rate at which students earn college degrees will pivot from growth to decline by 2022, according to a 2016 report from the Massachusetts Department of Higher Education. In New Bedford, where less than 20% of resident 25 and older hold a Bachelor’s degree, the median household income is approximately $34,000 with an 8% unemployment rate. By preparing and empowering more students to succeed and graduate from college, MIE actively works to close the gap for future generations across the state. Each year, MIE serves more than 10,000 students like Kaitlyn across more than 75 public schools in Massachusetts like New Bedford High through its AP STEM and English program, in addition to supporting struggling school districts across the nation. Since the program’s inception, MIE has more than tripled the number of qualifying AP exam scores for female students and more than quadrupled qualifying AP exam scores for African-American and Hispanic students, showing tremendous improvement in college readiness for these students. MIE students are more likely to matriculate, persist, and graduate from college, and that means more youth in our communities prepared to be innovators in the face of 21st century challenges. This critical work is made possible by individual donors like you, donors committed to empowering all students with a high quality education. Your gift means more students like Kaitlyn have the opportunity to take rigorous classes with highly trained teachers that prepare them for college. Your gift means more students like Kaitlyn see doors open to many career paths that can come with $830,000 more in lifetime earnings. Will you make a gift today to support a high-quality education for more students like Kaitlyn? $79 fills one MIE classroom with books and supplies.